Enjoy these fun activities based around the wood where Little Red Riding Hood walked to Grandma’s house. 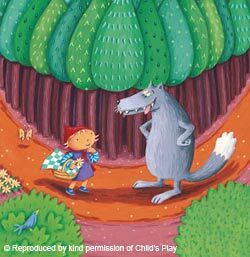 Read and enjoy together the story of Little Red Riding Hood. Listening to a story helps children to build imaginative pictures which create a different world from their everyday experiences. However, for young children, we need to provide a foundation of understanding upon which to base their imagery. Illustrated stories help, but are better reinforced by real-life experiences, which let the children identify with the world that the characters belong to. If possible, and with parental permission, take the children on a woodland walk. Remember to carry out a risk assessment of the area beforehand. Collect different-coloured and shaped leaves, twigs and pieces of bark. Alternatively, show the children pictures of woods and forests. Talk about what Red Riding Hood may have seen on her journey. Back at the setting, suggest that the children create an indoor woodland (see activity 1). Each day, talk to the children about their woodland, to remind them of the story and their own experience of walking in a wood. Little Red Riding Hood (Flip Up Fairy Tales series, Child’s Play); local wooded area or pictures of woods.